Comes with A Stainless Steel Straw and Cleaner! Soft and Flexible, Perfect for small children and toddlers! , Dishwasher Safe! 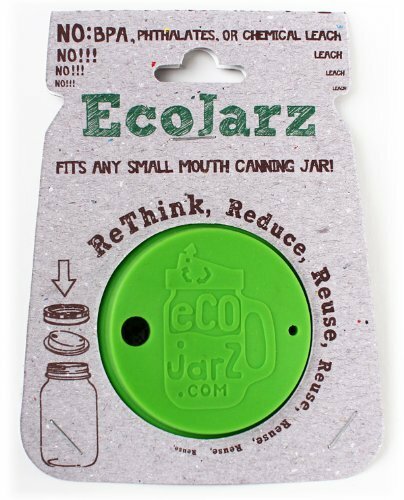 EcoJarz drinking lids are perfect to use with your glass regular neck canning jars. Simply attach the high grade 18/8 stainless steel drink top and screw it on with the stainless steel canning jar lid and vilia you know have a glass drinking cup or for kids a glass sippy cup. Includes: Qty 1 EcoJarz Stainless Steel Drinking top and a stainless steel ring/collar to screw the top on securely. ps...don't forget to order one of the EcoJarz stainless steel straws to have the perfect glass straw drinking cup. Image below is of the stainless steel topper, the one you would be purchasing is the silicone topper pictured above. Non Plastic, Non Reactive Food Grade Silicone. Comes with Stainless Steel Straw and Straw Cleaner The EcoJarz drink-top will fit any standard mouth canning jar - whether it's an empty apple sauce, jam, or spaghetti sauce jar - and turn it into a glass to-go drink container! Our drink tops are made of high-quality FDA Silicone. They are Dishwasher Safe. EcoJarz gives you the healthful benefits of glass and Non-Reactive Silicone and the ability to use and reuse hundreds of glass containers commonly available. Start up-cycling your jars and drinking toxin-free today! EcoJarz Drink-top with straw and cleaner only, No glass or jars or Jar bands included.